This is our universal fairing mounting bracket, which is perfect for many vintage applications. It is designed to mount a frame mounted fairing (full fairing or half fairing) onto you bike. It has a Y-shaped bracket that will hold a standard 7" headlight (adjustable in the slots), while the outwards bent tips provide you two forward mounts left and right of the headlight. The saddle on the other end either clamps onto the steering head with the 2" U-bolt, or can be welded in place if that's not possible. The Y-bracket slides into the saddle bracket, allowing you to slide the fairing bracket back and forth in the desired position. Once that position is found, simply dril a hole through the tubes and put a bolt in it to prevent movement. This is a universal bracket, meaning it will provide you with a good starting point to mount a fairing. Most projects require further fabrication or modification by you, the builder, to mount the fairing onto your bike. If you have any questions, please give us a call and we'll be happy to talk shop and give you some ideas. These brackets are stamped to our specifications from a high quality, durable aluminum. 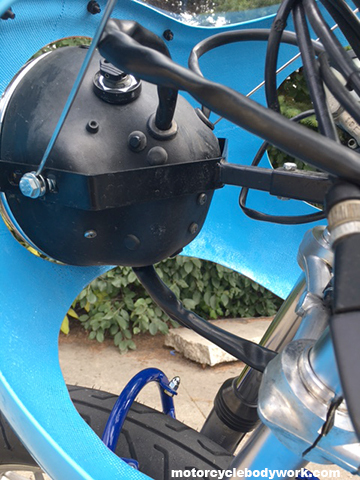 The are an excellent aid in mounting a quarter fairing to a standard, 7" headlight with mounting bolts on both sides. Simply take the bolts out, slide them through the brackets and bolt them back on.The outwards bent tips provide you two forward mounts left and right of the headlight. The 1" long slots allow you to adjust the position of the headlight. Please take a look at the measurements in the diagram to check if these brackets are suitable for your application. These rubber mounted headlight brackets are made of aluminum with a chrome steel clamp and look great on vintage cafe racers. You will need a set of these when installing clip ons on your vintage bike, because the stock headlight ears are too tall and don't leave any room underneath the top clamp. The height of these brackets is less than 3" so these are an excellent replacement for the stock headlight ears, not to mention they look way cooler. As a bonus, they will allow you to move the headlight down lower so you haver room to lower your gauges so they don't stick out all funky, no matter what type of handlebars you are using. Centerline forks to center of holes 4.5". This is a super clean universal license plate bracket. Tuck it up underneath a tail section and bolt to the frame or custom mounting point. The top part of the bracket is slotted which makes this bracket very flexible in application as it allows mounting bolts to be between anywhere from .75 to 4.75" apart. This is the same license plate bracket with two turn signal mounts. Clean looking license plate bracket that you can tuck up underneath a tail section and bolt to the frame or custom mounting point. The top part of the bracket is slotted which makes this bracket very flexible in application as it allows mounting bolts to be between anywhere from .75 to 4.75" apart. These studs have a large perforated head which makes them perfect for mounting seat pans to seats or various blind mounts on the inside of panels. You can fiberglass or epoxy them into place. 3/4" long, 1/4"-20 thread, nylocks included. These fasteners work great with the brackets listed above. They are nice oval head fasteners, that disperse pressure well because of the large head. Philips head M6x20mm. Set of 4 - comes with nylock nuts. We're the original designer of the shark fin shaped toe guard that has inspired a thousand copies - and saved a few hundred toes - over the years. Ours has a thick, round leading edge to minimize the chance of hang ups and is made from 100% carbon fiber. Installation of this guard can help prevent some pretty horrific injuries in case of a crash, by keeping your piggies from getting sucked into the chain/rear sprocket. Can be installed on any square sided swingarm by drilling and tapping the swingarm or with pop rivets or rivet nuts.